At long last, Verizon activated DSL at my apartment and I'm back online though it will take me a good week to catch up on e-mails. Actually, wiith seven classes and about 475 boxes to unpack, it may never happen. But I'll try. Moo.com is offering the first 10,000 Flickr Pro users who respond 10 free MiniCards which are like business cards with one of your Flickr photos on one side and text on the other. For non-pro users it's $19.99 for a set of 100, and you can print a different photo on each card if you want. Finally, I will have 10 business cards to pass out to all the new people I'm meeting here in LA. Audrey sent me a link to this M&M Dark Chcolate product launch movie puzzle online. It's a poster with visual clues for 50 "dark" movies (horror, for example). Good fun, though I'll have to tackle this in earnest some other time when I have a free block of time (which, judging from my courseload, will be sometime in mid 2007). Dark chocolate M&M's? Sounds tasty to me. I was a dark chocolate Kit Kat addict when those came out, and occasionally I still have to satisfy my cravings by sourcing them through eBay. Because dark chocolate melts at a higher temperature than regular chocolate, it can completely transform a once familiar candy, often in a wonderful way. Cinematographer Style is a movie about, yes, cinematographers, following in the tradition of Visions of Light. Documentaries about filmmaking specialties seem to come in twos, e.g. The Cutting Edge and Edge Codes.com, both documentaries on editing. I was sad that I was unable to catch a screening of Cinematographer Style at the DGA theater in LA tonight. I just love this type of stuff, especially now that I'm in the biz, sort of. Some economists surveyed 3,200 high school seniors and estimated which of two colleges students would choose if they were admitted to both. The resulting matrix is here. 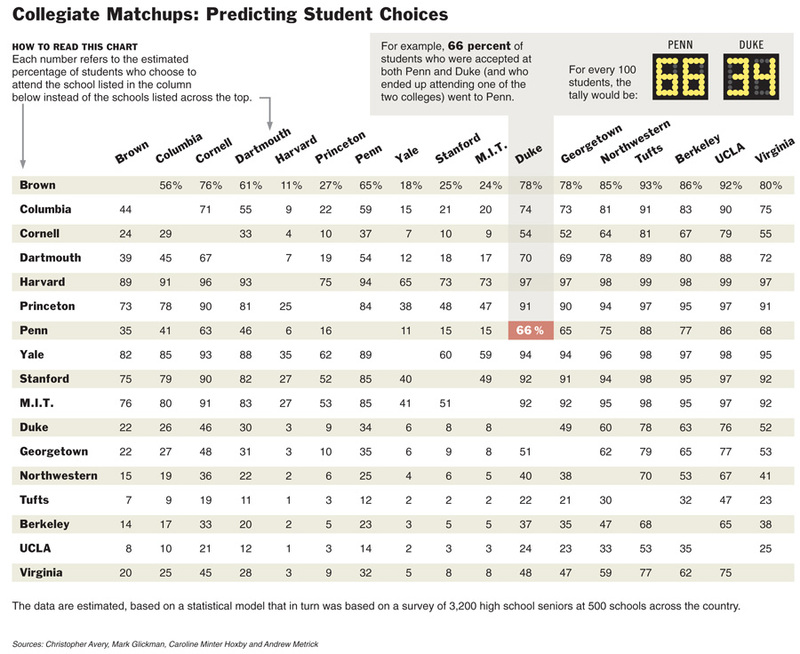 Harvard was the one university that won its head to head matchup with every other college in the survey.